Reddiplex have successfully supplied profiles for aluminium, PVC-U and steel systems for a number of years. We have upheld long-standing business relationships with established systems suppliers through a combination of premium products and flawless service quality. Over time by virtue of innovation, investment and dependable account management Reddiplex has propelled itself to the forefront of the industry. In industries where sustainability and thermal efficiency are key to high performance systems, a combination of premium material compounds and cutting-edge extrusion technology, enable us to supply a solution that guarantees satisfaction. Contemporary polymers allow us to produce high-performance profiles that are weather and UV resistant, aesthetically pleasing and energy saving. We offer customers an expansive portfolio of thermoplastics and rubbers to choose from. Each material type is suitable for specific products and certain applications however they all have one characteristic in common, success. The extrusion methods we offer range from single and co-extrusion, which are used for volume extrusion solutions on a regular basis, to those which are used for a much higher specification of product and involve a more complex extrusion process such as cross head extrusion. Single hardness profiles are manufactured from a single material and can be flexible, rigid or rubber, which includes sponge based products. Co-extrusion combines two different materials or colours into one single profile. Special twin head extruders and purpose made dies are used for this process. Triplex extrusion, involves the extrusion of three different materials into one single profile. This involves highly complex machines and dies. 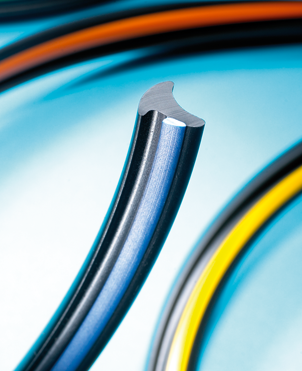 Cross head extrusion is similar to co-extrusion but rather than combining different types of plastic or rubbers, it is possible to embed different components such as aluminium and glass fibre cord into the profile. Whether its residential windows or multimillion pound curtain walling projects, Reddiplex can offer an extrusion solution for your system. Expertise and experience in the extrusion of a variety of standard and high grade materials, coupled with extensive technical knowledge of extrusion processes ensures customers receive an innovative design solution specific to their particular application.